This year was certainly an eventful one at MuslimGirl.com, to say the least. Dealing with a literal cheeseball in office and battling some of the worst anti-Muslim policies in years proved to be challenging, but it comes as no surprise that our team and readers rose up to it. Our 2017 was decorated with another amazing year for Muslim Girl, our writers and all those who have supported our mission. We have been so fortunate to share each experience with all of you, and wanted to take a moment to reflect on some of most exciting moments. 1. Say hello to Muslim Women’s Day. Muslim Girl partnered with a number of media brands including Teen Vogue, Refinery29, Huffington Post, and MTV to establish and celebrate the first-ever Muslim Women’s Day on March 27. On this day, we called upon our allies to pledge to flood the Internet with positive and diverse stories elevating Muslim women’s voices around the world. The hashtag #MuslimWomensDay went viral on multiple social media platforms and was the top trending hashtag all day, with millions of interactions globally. The day really taught us the meaning of unity – get ready for round 2. 2. We stood on the right side of history at the Women’s March. Muslim Girl writers and editors formed a contingent at the Women’s March on January 21, a protest that made headlines and history. Not only did we have a presence in the main march on Washington, D.C., but the Muslim Girl Army came out in spades in cities across the nation, attending and speaking at rallies about Muslim empowerment, equality, immigration and representation. From California to Kentucky, Muslim women were both part of as well as leading the conversation that unfolded that day. Even more exciting was watching as other Muslim women and our allies marching together hand in hand in solidarity. 3. Our #AskAMuslimGirl series with Teen Vogue won a Webby Award! Our web series with Teen Vogue called #AskAMuslimGirl received a Webby Award in social media for its work in uncovering Muslim women stereotypes. Caught in between the crosshairs of men who uphold a patriarchal society, and Donald Trump’s political climate that seeks to disempower minorities, this series was one way that Muslim women reclaimed their narrative and talked back by educating their fellow non-Muslim millennials. 4. The Muslim Girl Foundation is born. Muslim Girl understands the struggles of paving a way to make an impact, so we wanted to do something that would give opportunities to Muslim girls all around to pursue their dreams. Launching the Muslim Girl Foundation was our way of ensuring that Muslim women’s voices continue to be elevated and heard in the media. This new independent, non-profit arm of MuslimGirl.com started with a scholarship fund to empower Muslim women in reclaiming their narrative. It’s important to not only have the mic, but also to pass the mic to those who deserve to be heard. 5. We partnered with Getty Images to redefine the representation of Muslim women on the Internet. Remember the days you would search for images of Muslim women and only find women looking, sad, depressed, and *OPPRESSED*, dressed in black from head to toe? Those days became long gone when we partnered with Getty images to show what real Muslim women look like. By creating a collection of stock photos that are of real Muslim women and shot by real Muslim women, we reframed who we are online through our own gaze. We were instantly flooded with positive messages from journalists and media heads who previously could never find the right photo to go with their Muslim women stories. Now, when you search Muslim women, you’ll most likely find images that look just like you – totally real and amazingly strong! 6. We provided you with the Muslim Ban Guidebook — unfortunately. It only took he who shall not be named his first 10 days in office to implement the Muslim Ban, so we acted just as fast to compile for you the most extensive resource on everything you need to know. The Muslim Ban Guidebook has since been used by educational facilities, law offices, social services and major institutions as a source for those looking to educate themselves or actively engage on the topic. While the ban still continues to be a concern, we need to arm ourselves with all the information we need to fight back. 7. Muslim Girl launches the first brand collab in history for American Muslim women. Muslim Girl launched the first brand partnership catered to Muslim women in the U.S. commercial market with a line of fresh nail polishes crafted especially for Muslim women. The array of seven nail polishes, collectively called #HalalPaint, used a breathable formula that allowed air and moisture to permeate the polish barrier for those concerned with their ablutions. With names like “Ig-Noor The Haters” and “#MuslimGirlFire,” the popular halal-certified line totally expanded the definition of beauty by making it more inclusive of women like us in the beauty industry. We would like to take this time to thank each and every past and present Muslim Girl team member, writer, guest contributor, ally, partner, and reader who has been there with us every step of the way. We made huge waves together in 2017 and turned our clapback into a movement. We can’t wait to take 2018 by storm with you. Can We All Agree to Make This Our New Year’s Resolution? Why do you support Sharia and the oppression of women? Wearing a hijab is a commitment to sharia. Sharia says kafirs ( non Muslims) are inferior to Muslims and should be killed. A hijab is also a tool of oppression and objectification. Indeed. 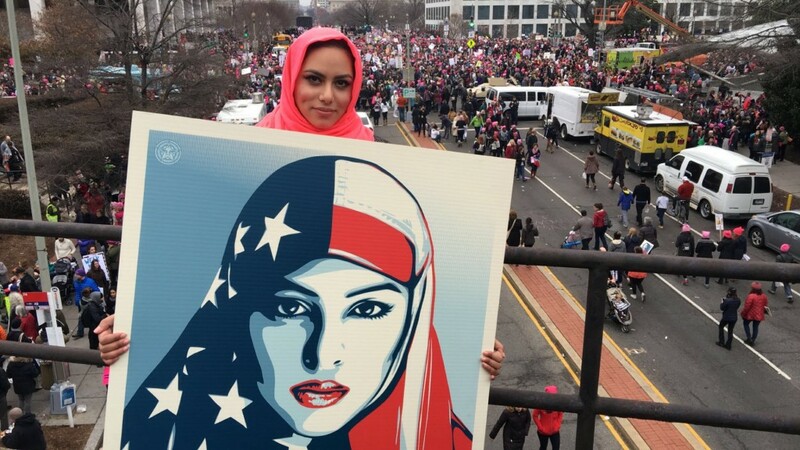 One of the most paradoxical images is the one on the poster of a woman accepting the abolishment of feminism by sporting a misogynistic hijab decorated in the fabric of the American flag – one of the most liberal, pro-women countries/iseas in the world. Too bad these women are not lobbying to support the women in Iran who have no choice but to be Muslim and wear a hijab (actually, some women in Iran are not Muslim – it is only illegal to be a non-Muslim citizen in places like Saudi Arabia). The Iranian people are chanting for freedom and the Mullah’s solution is to stop teaching them English. When will Muslim women truly care about the injustices against – Muslim women? France does not ban the hijab. Women are free to wear them. France bans face coverings, not hair coverings, which goes for all face coverings whether niqabs or ski masks. Calling me names doesn’t make your false facts right or your disparagement just. It also doesn’t take away the horrors that women under Sharia face if they aren’t covered by the way the men who create the laws demand. So, do you have any names to call the leaders in Iran who arrest women for not wearing a proper hijab? Or Saudis Arabia or Afghanistan for not wearing niqab or burka? Or the self proclaimed religious police in the West who make life miserable for women accepting of a more liberal dress code? Or do you just have names against people like me who fight for rights of all? I responded already to the troll who just wrote to you regarding a lie she wrote to me, erroneously calling me the same name. Funny, when you look at her history you will see a genuine example of bigotry of his/her hatred towards Hindus just a few posts down her archives. Enemies of truth always project their wrong doings into those they want to bring more harm to. Wearing a hijab IS a commitment to Sharia. Sharia says Kafirs are inferior and should be hated and/or killed. These aren’t my words, these are the words of Muhammad.